If this card is discarded from the hand to the Graveyard by a card effect, draw 1 card from your Deck. If this card is discarded from the hand to the Graveyard by your opponent's card effect, draw 1 more card from your Deck. Broww: Nont just for Dark World anymore. This is the only Dark World monster we're doing this week, si I can safely talk about the rest of them in my review. This guy can be splashed into a side deck (or a main deck where everyone runs hand control) and still function. He's a better Electric Snake. He's Dark (meaning you can remove for Chaos Sorcerer or Strike Ninja), 1400 (so he can kamikaze with Don), gives you the same 2-card bonus if your opponent discards him, and STILL replaces himself with 1 card if you discard him. 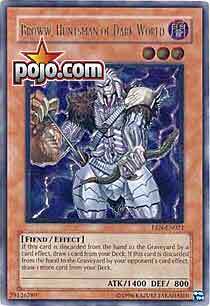 Dark Paladin Today we look at Broww, Huntsman of Dark World who is quite the interesting monster. He only has 1400 atk. and 800 def. which isn't good, but not awful considering he's only Level 3. So, if you use an effect to send Broww from your hand to the graveyard, you get to draw one card. If your OPPONENT does something to send him from your hand to the graveyard, you get to draw two cards. Not much else to say about this card, but it is clearly necessary in Dark World deck, and maybe even 1 as tech in your normal cookie cutter deck. Stats : Broww, Huntsman of Dark World is a Level 3 Dark/Fiend. Level 3 may be one of the best Levels you can be: not only are you a no-Tribute Normal Summon, but you slip under Level Limit-Area B and Gravity Bind. Dark Monsters no longer have the support they did now that Black Luster Soldier – Envoy of the Beginning is no longer with us, but there are still a few bits of Support not common to all Attributes. In my opinion the Dark Attribute is the strongest Attribute family just due to their membership. Fiends are not the strongest Type, but they do have some support and once again many of the strongest cards in the game are part of this Type. Broww, Huntsman of Dark World has an ATK of 1400. Given that it already slips under Level Limit-Area B and Gravity Bind, it isn’t too bad a score since this allows Broww to get under Messenger of Peace. It also is small enough for Mystic Tomato, Sangan, and Last Will to target. The DEF is sadly puny at 800, though. Ideally, it’d have a 1450/1500, since that would keep all these advantages, but the ATK is the important thing. Of course, Broww is a Dark World Monster, giving it access to all their support, and giving it greater significance as the biggest Dark World Monster that slips under Level Limit-Area B, Gravity Bind, and Messenger of Peace. Effect(s) : The effect of this card is solid: if you discard it (for something other than a cost), you get to draw a card, and if your opponent makes you discard it then you get to draw an additional card over the first effect (that is, two cards). This effect further increases it’s usefulness to Dark World decks, as such decks have so many ways to make sure at least the owner of Broww can discard him easily. In other words, it’s almost like Broww is a free slot. Combinations : Dark World decks would be the obvious place to include at least one copy of Broww in the Side Deck, just because he’s an easy way to handle the stalling aides listed above and still fits in with the Dark World theme. Given that he should be easy enough to discard in a Dark World deck, I would think a copy or two in the main deck should also work. After all, while your real deck size goes up by one, your effective deck size doesn’t. Even allowing for the whims of probability, Broww should be valued as less than a whole card. Traditional : 3/5-Dark Monster? Check. Punishes the use of popular hand control functions? Check. Is he big enough to make a difference? Check. Now, that being said, there are many other better cards for decks in general. That’s right, “in general”. In a Dark World based deck, he clocks in at 3.5/5. Advanced : 2.5/5-Again, this is a general score for pretty much any deck. In actual Dark World decks, Broww acts should be valued at about 3.25/5. The reason would be you have your own tricks to discard him, but it’s no longer likely your opponent is running as much random/semi-random discard effects. I can see Side Decking Broww in case of Hand Control decks: he isn’t as rewarding as many other Dark World Monsters when discarded, but he also isn’t as useless when he isn’t discarded. Limited : 3.5/5-His native set includes plenty of support, and even if it isn’t, 1400 ATK is passable here for a non-Tribute Monster. Broww appears to be a solid, well made card. He has some use outside his own theme, given that there are a least a few cards that discard your own cards as part of the effect, and the Monster “attached” to that effect isn’t negligible. He’s not useful enough to be consistently Main-Decked, but the Side Deck likes him. How appropriate that we would kick off this week with a Dark World monster. My team is slated to play a rival at an upcoming event and I just found out Robert Pace would be joining them. For those who don't know Robert Pace is a pretty accepted pioneer of Dark World. His deck top eighted a regionals and got a minor amount of press at SJC San Mateo. But I'm digressing. On with the review. Broww is a staple in Dark World decks - or at least the manner in which I'd construct one. It's need as a support card in this format seemed to increase with the loss of Sinister and restriction of Night Assailant. In Magic they call the general mechanic "cycling". You pitch a card to draw another. For YGO purposes this makes discarding effects easier to cope with. As a pure Dark World deck I would suggest no more or less then three Browws and three Dark World Lightning maindecked. Outside of your Dark World decks you may still find some use - though admittedly not as much. Most cards that involve discarding outside of the theme do so as a cost. Hence, they aren't written into the effect and won't cause Broww's activation. But there are a few rentsy ideas, such as Card Destruction, Morphing Jar, and Dragged Down to the Grave. All and all, though, the cookie option of Dekoichi will probably suit you better for cycling. Dark World (either format) - 5/5 Its the heart of the deck. Not the swarm, but the speed. Alright, so I’m a bit behind, but I’ve had a cold recently. So this week started off with Broww, my first comment is that they really trashed the Dark World names. So looking at this card I see right away an upgraded version of Electric Snake. So right away this makes a nice solid tech card against decks that focus on hand disruption. Although it has searchable stats, it really isn’t worth it, cause then the opponent will know that it is there, and will play accordingly. Really this is best off as a sided in tech that you save for when it is hit, or in a Dark World Deck. There really isn’t much else to say, a decent, balanced card that contributes well to the theme of it’s archetype.